I got my invitation to Ravelry! Eeeeee! I’m on as MotherChaos over there, too. I’ve been having a marvelous time playing around with everything, although as usual I am somewhat lacking in free time to do so. However, when I started working on inputting my stash, well, I hit a wall. I can’t steal the pictures of others to put up on Ravelry, and the idea of taking each of my beauties out of storage, photographing, uploading to Flickr and then dragging that into the little box gave me a serious need to lie down, immediately. And now, it is a lovely example of half-empty, well-dusted and even lemon-oiled perfection. The trash can is overflowing, as is the Goodwill bin. The things I found in there boggled my mind – like sunscreen with an expiration date of 1992. Seriously. Think about that one for a minute. I also cleaned off my desk and did, in fact, spend a little time tidying up my stash, which had begun leaping off the wire shelves last week because I had been neglecting it so badly. So you can see why I don’t feel like tackling any new projects which smack of organizing right immediately now, yes?! I’ll get around to it. Eventually. This is Cascade Sassy Stripes #713, a super-warm blend of 75% superwash Merino and 25% nylon. They were fun to knit and went surprisingly fast, and I have to say they feel marvelous on my feet. Although considering how much time I spend sitting around waiting for one kid or another to be finished with something, I suppose I shouldn’t be surprised that my portable projects are going a bit faster now. …and I am already at 12” on the back, a scant 2.5” away from starting that drastic shaping for the raglan sleeves. I’ve done so many socks and sportweight projects lately that the speed of the larger needles is surprising me. 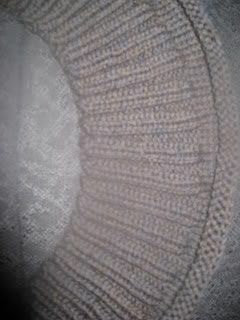 It is also great knitting for right-before-bed and in the brain-dead calm of morning. I spent about forty-five minutes this morning just zoning out watching incense smoke drift and knitting away. I’ve been doing so many “interesting” projects lately (“interesting” should be pronounced “challenging and/or frustrating and/or needlessly complex”) that I’d almost forgotten how good it can feel to just knit and see progress right away. In other vital news (ahem), I’ve decided (after it fell on my head repeatedly while I was pulling out other things to put up on Ravelry) that the new Socks in Progress will be in Zitron Life Style, #1860 - this is a slightly thicker yarn than I’ve been using lately for socks, and I think I’ll be using a shockingly huge #3 needle instead of the #1s that I’ve been carrying around with me like some kind of very skinny life preserver for months now. Which I suspect puts me in a class of Knitting Geekdom all my very own. ANYWAY. It is nearly time to start another week of the non-stop Action! And also EXCITEMENT! that is my life. Anyhow, I couldn't resist the pull of the lovely stash page. My stash and I had a photo session this afternoon and it's all listed now. Granted, I think I had a lot less to deal with than you do so it went fairly fast. It was like a modeling session. I had a production line: out of the ziplock, on to the cream backdrop, SNAP!, back to the ziplock, Next! DH thinks I am insane. And he is probably right. I got my invitation yesterday, and spent the ENTIRE day ignoring my family while I played about with my stash, and logged WIPs and FOs, and joined groups, and.... (happy sigh). Tama, you're not the only knitting geek, you're not even the biggest. I can tell the difference between a 2.25mm and a 2.5mm by feel alone. I can even pick that same 1/4mm difference in two otherwise identical pale grey steel DPNs lying side by side on the table. After knitting nothing but socks on 2.25mm and 2.5mm for the last several months, I am really ripping through the BSJ I'm working on at present on thumping great 5mm Addi Turbos! It feels like I'm knitting with tree trunks. And Sunny? You need to get your DH an obsessive hobby. 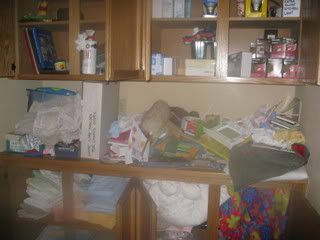 Mine is a total computer geek, has about fifteen disembowelled computers in his hobby-room, and every time he starts to 'dis' the stash, I can just point out to him that at least the stash is warm and fuzzy and packs away into one (admittedly large) cupboard. Do we get to see the after pictures of the built-in? Pretty please? I made the executive decision to skip the stash part of Ravelry. Projects, queue, favorites and books is plenty for me. Who wants to look at pictures of mohair I bought in 1994 anyway?? I did the whole stash thing but it took a week or two to get up the nerve. I didn't really want to know. The thing I love about having the stash up is for example, last Thursday when the new Knitty came out I could look at my stash from work and see if I had enough of such and such to make something or if I needed to order something else or crawl other people's stashes looking for a certain dyelot in someone's for sale/trade page. Yup, you will note that my stash is astonishingly un-photographed. I did open up the drawer and count what I had in there, for record keeping, you know, but I didn't see why anyone would want a picture of oh-so-unique skein of lambs pride with the label missing. Heck, I'm still working on tracking down some of my FOs for photo sessions. I am not even going to google "Ravelry". I do not want to know. So envious of the clean built ins... And very impressed you could do it just as you got into Ravelry, too. I envision getting sucked into this knitting vortex from which there is no escape, and certainly no cleaning... But anyway. Love the stripy socks, too. Wow. Organizing and finished knits and Ravelry, oh my! I'm still trying to put away everything left over from moving the third time in a year. (Something I do not recommend, by the way.) One of these days I'll have me an organized stash, though...yep...one of these days! 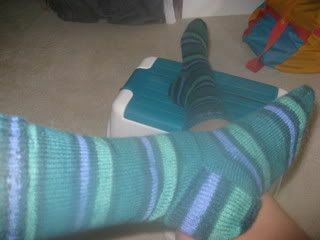 No, no...I'm so with you... after spending all summer knitting socks on little bittle needles, I cast on a pair w/worsted weight yarn and size 4s. It feels like cheating. I laugh maniacally to myself as I knit, like I'm doing something bad. BWWWWUUUUAHAHAHAHAHAHAHHAHAH!! !